Hospital CEO Bill Considine presents Distinguished Service Award to volunteer Chris Witschey. There’s a sign on the door when you enter the back hallway of the rehabilitation department with a picture of a black lab that says, “Francis at work.” If you think the rehab department has gone to the dogs, you’re half right. On any day of the week you will find longtime Doggie Brigade™ sponsored by Milk-Bone® volunteer, Chris Witschey, and her black lab, Francis, or Gracie, a Husky-mix, working alongside patients to share the healing power of the human-animal bond. Since 2005, Chris and 5 of her 9 dogs together have given more than 5,300 hours of their time to the hospital. It’s people like Chris for whom the hospital’s Distinguished Service Award program was developed to recognize. Since its inception in 1979 only 2 volunteers have received the prestigious award, that is, until now. 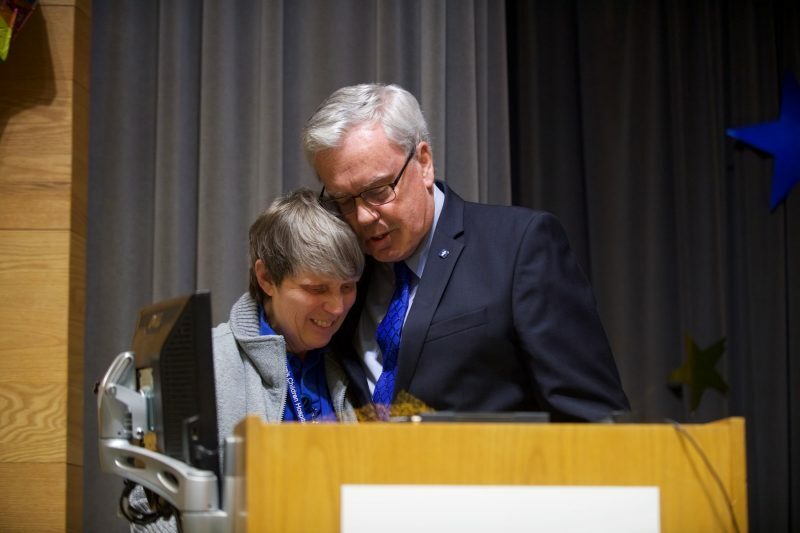 On January 24, Chris became the third volunteer bestowed that honor. You may think someone who owns 9 dogs grew up with a pack of animals, but that wasn’t the case for Chris. As an adult, Chris worked as a driver for United Parcel Service (UPS) and was bitten 13 times by customers’ dogs over her 30-year tenure – requiring stitches, shots and antibiotics nearly every time – but it never inhibited her willingness to expand her own brood. “All of my dogs are adopted or rescues,” she said. Not only are they rescues, Chris seeks out dogs that have physical disabilities and spends months training them to obey commands – even teaching her deaf dogs to respond to sign language. Her dogs respond to commands like “sit,” “stand,” “stay,” and “come” from the patients and therapists too. Chris says her younger brother, David, who had both physical and mental disabilities, was her inspiration for adopting dogs with special needs. “David helped me learn how to interact with people with physical and mental challenges,” she said. “I have 3 deaf dogs, a blind dog, a 3-legged dog and one I’m pretty sure has ADHD,” she joked. It was a chance meeting at a local pet store with Bernie Schwartz, one of the founding members of the Doggie Brigade™, and his dog, Ben, that encouraged her to pursue volunteering at the hospital. 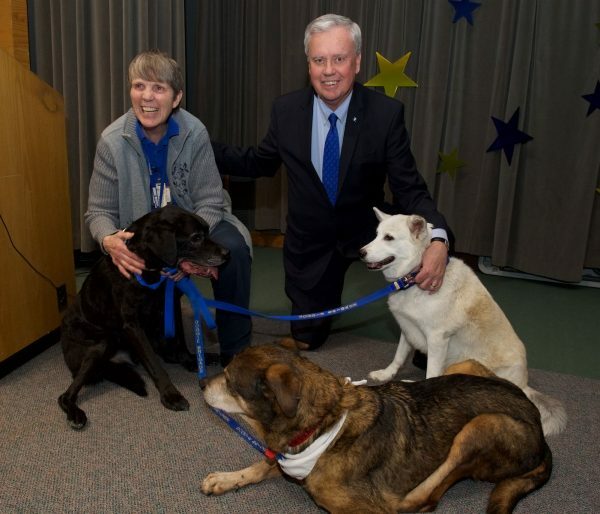 Chris poses with Bill Considine and her therapy dogs, (L-R) Francis, Handsome and Gracie. Chris volunteers 5 days a week in the rehabilitation department with Gracie and Francis and 2 days a week in the Partial Hospitalization Program (PHP) with Handsome, one of her deaf dogs. Another reason is patients in the day rehabilitation program who receive physical or occupational therapy for chronic conditions, pain, deconditioning, or are recovering from illness or injury. Chris often works for weeks or months with the same patients. “One boy couldn’t lift his foot off the ground when he first started in the day rehabilitation program,” she said. That same patient now practices throwing a ball for Francis to fetch or balances on stability disks while throwing a ball over makeshift bowling pins for Francis to plow through. “Working with Francis and Gracie makes my therapy exercises feel more like fun and less like work,” he said. Physical therapist Sarah Brown says working with the dogs helps provide a fun distraction and emotional support when her patients are scared or upset. Chris beams with pride each time one of the patients she has worked with reaches discharge day knowing she and her dogs had something to do with their progress.